The preparatory process had been quite uncertain. The political signals coming from the meetings of the organisers shifted quite strongly. The first call was made by a number of environmental and climate organizations at the COP14 meeting in Poznan in Poland in December 2008. A first preparatory meeting in Denmark took place March 10 in 2009. The Participants can be grouped in seven categories: Climate and environmental movement including activists from KlimaX, The Danish Climate Movement and Friends of the Earth Denmark, NGOs including the 92 group, a coalition of the biggest environmental and development NGOs in Denmark and Greenpeace, The Danish Church through its development aid organization, Marxist Leninist and popular front organizations including the Daily Arbejderen (The Worker), The Communist Party and Danish Cuban Association, Youth organizations including Pedagogic students and a Socialist Youth organization and one small trade union. Phil Thornhill from Global Climate Campaign also participated. The first meeting called for a ”big, broad and popular” demonstration with central demands calling for ambitious acts now and solutions that are socially and globally just. 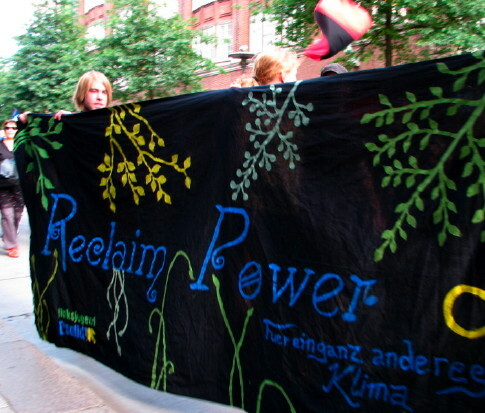 A coordination group was set up with almost only climate organizations, the climate movement, KlimaX and a Climate network as well as the Socialist People’s Party Youth. 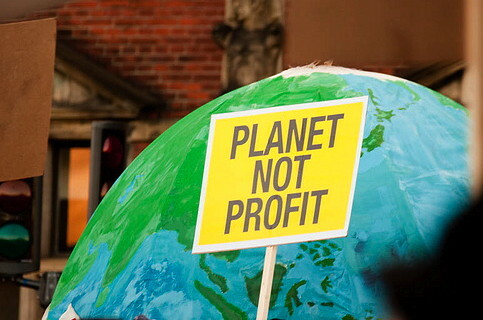 “We demand that world leaders take the urgent and resolute action needed to prevent the catastrophic destabilization of the global climate, so that the entire world can move as rapidly as possible to a stronger emissions reductions treaty that will be effective in minimizing dangerous climate change while maintaining principles of social and global justice. In spite of that there were not many more organizations present there were now strong hopes for the important construction workers union and the economically resourceful WWF had together with the equally strong MS/ActionAid Denmark entered the scene. The coordination group was supplemented once more, this time with MS/ActionAid. Politically the earlier message to put equal emphasis on social and global justice now changed. Gradually all notions concerning social changes were marginalized to part of a phrase on principles. Instead the demands for ”leaders” to ”take the urgent and resolute action” and North-South interstate relationships became the only central points in the political message. With the entry of Oxfam in the early autumn this shift became even more accentuated. The result was a chocking pink flyer with a text in yellow and white stating ”Planet first! 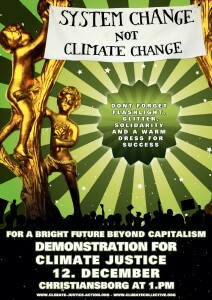 People first!” and then ”family-friendly climate-demonstration”. Furthermore the texts reads ”It is now something happens”, ”the future of the planet will be decided”, ”the watch is ticking” – all part of the big NGO tcktcktck campaign rhetoric for COP15. The leaflet claim that ”the leaders of the world have the power to change the course of history in Copenhagen. If we are many enough, that demands action they cannot ignore us.” It ends by saying join a peaceful and colourful Global Climate Action Day in Copenhagen. It is hard to make a leaflet less political or more devote in its approval in advance of whatever the politicians decide. On the back page was the official platform and the list of organisations supporting the initiative. The proposal from Oxfam had been happily received by all in the organizing committee. Why was social justice forgotten? As many of the central organizations involved had left wing people representing them it was rather confusing. Their whole concept of the December 12 initiative was to be broad. Thus they promoted a platform for many different messages rather than a joint manifestation. And a main message within the NGO and parliamentary focus to send signals to politicians and global justice concerns framed as and issue of North-South relationships between countries. This means that there was less common political commitment and quite contradictory messaging. 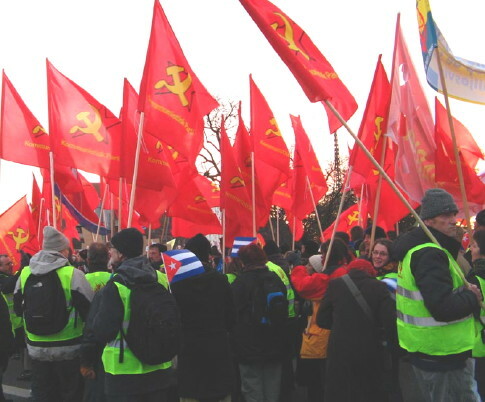 In Sweden a representative on the left wing of 12 December initiative claimed that the risk that the demonstration would be coopted by the establishment was minimal: The left seemed not to worry about the main political message from the demonstration. This was not only in their understandable concern for making a broad demonstration happen. It was also due to that key left wing organizations have chosen opportunistic politics rather than seeing the social revolutionary potential in the climate issue. 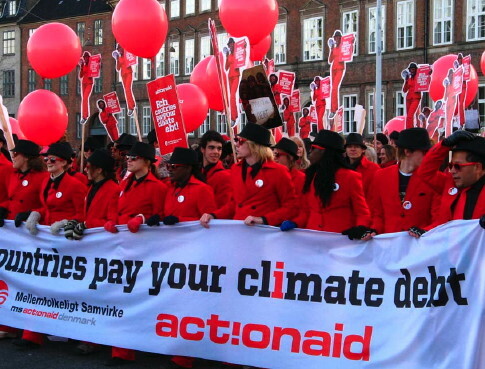 Thus the most radical and social movement oriented left wing parliamentary party in Denmark, the Red Green Alliance had as their political demands towards COP15 demands for emission targets and interstate North South issues as demanding that rich countries use big sums to aid the developing countries and no to global carbon trading. Thus there were no problems for this party that the issue of social justice was erased from the main messaging. 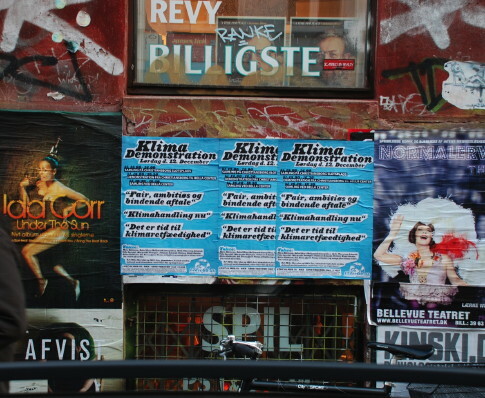 In Sweden the organization mostly involved in the Copenhagen preparatory for the demonstration was Klimataktion, a newly established organization dominated in its leadership by left wingers, many journalists from the anarchosyndicalist trade union weekly. This organization to quite some extent delinked the climate issue from its broader ecological and social political context and reframed it into climate policy concerns. War metaphors and the need for a global carbon trading mechanism based on individual rights was promoted by these left wingers as solutions as well as the need according to some of them to continue using nuclear power. The lack of social revolutionary perspectives or even lack of strong criticism against false solutions was not much of concern for this organization either. 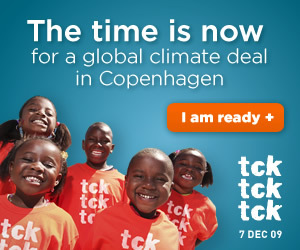 During COP15 they merged their twitter from Copenhagen with that of the tcktcktck campaign. The environmental movement was concerned. With growing tensions between more social movement oriented organizations as FoE and NGOs like WWF there were problems. Thus FoE organized a flood action to feed into the demonstration with one main message, to go against the carbon trading mechanism proposed for the COP15, proposals supported to quite some extent by both WWF and other NGOs. In the second broad initiative in Copenhagen, the Klimaforum dominated by many small ecological and system critical organizations and with the left and NGOs more or less completely marginalized the concern for social revolutionary perspectives were a lot more present. The call against false solutions as nuclear power or other ”technological fixes” was explicit together with the idea to promote a change by another economic system and base the solutions in local communities rather than trusting politicians to become agents of change. The Danish organisers also were able to make an alliance with global popular movements with social justice concerns strengthening a joint system change not climate change message from Copenhagen. As Klimaforum had 50 000 visitors it is clear that a lot more radical platform than the 12 December initiative call also could achieve broad participation in Copenhagen. While the open agenda of the 12 December Initiative was a least common denominator biased in the interest of NGOs and political parties the hidden agenda was also biased, but in a even more problematic sense. At the core of the present Western liberal model lies a denial of its inherent daily violence used against those opposing the militaristic, social, economic and ecological consequences of this present world order. At the core of the dominant solutions promoted by COP15 lie the same problems. The consequences of violent non-solutions or false solutions to climate change are already there to be seen. Violence through promotion of biofuel taking land for local food production in the interest of corporations. Carbon trading promoting land grabbing as well. Individualistic consumerist solutions which supports ever growing social inequalities replacing necessary social change and the violence that follows from this. Lack of action against fossil fuel dependency causing the oil wars and occupation organised primarily or only by the liberal Western world. Refugees from these oil wars as well as climate change refugees violently stopped at the borders or thrown out of the Western countries to mention some of this violence. Instead of addressing this violence by explicitly opposing false solutions as Klimaforum and Climate Justice Action did the 12 December Initiative chose to keep silent while instead talk more loudly of how peaceful the own demonstration should become. This position could easily by used by such NGOs and trade unions that promote social partnership politics were they together with industry and governments comes to solutions within the framework of the present system. Thus the inherent violence of the system is excepted and what remain the main issue is to oppose any violent forms of protest, or any forms of confrontational non-violent protests as well. Thus the threat of violence was as firmly put outside COP15 as it was firmly put outside of the platform as something to oppose in climate politics for the demonstration on December 12. The only violent threat remaining to address was speculations regarding other protesters to be able to present the own initiative in as positive manner as possible. Celebrity and parliamentarian speakers or from the movements? In October the power relations changed drastically in favour of a more clear political message. The global popular movements Via Campesina, Jubilee South, indigenous organizations and many others in the network Climate Justice Now! Decided to organize the Reclaim power action togeher with Climate Justice Action. The key organizations in the network were also invited to become members of an international advisory board for the Klimatforum. It was decided that the Klimaforum declaration title would be System Change not climate change, the same as the title of a joint CJA-CJN bloc in the 12 December demonstration. CJA also made a change in its Reclaim power plan by stating the goal as entering the Bella Center area, and not the building. Poster for the System change not climate change bloc. The new power relationships within the mass activities was expressed in the debates on speakers at the December12 demonstration. Strengthened by the idea of a joint bloc for all climate justice popular movements including Via Campesina, Friends of the Earth, Attac, Southern based movements, CJA activists, socialists and many others hoping for mobilizing a great part of the demonstration the negotiations could start. But it was a very depoliticized process. For some reason it was only going in one direction. The Danish representatives asking for more and more names while the principles for electing this or that speaker was kept outside the discussion, a depoliticizing procedure that by far was excepted by CJN and CJA. Any organiser of a demonstration of course wants to have a large number of proposals to pick from, the decisive issue is according to what criteria. On one point early criticism against the proportion of the speakers were only one third would come from the South was criticized. It was changed to half by the traditional method to extend the number of speakers. The original idea was to have three speakers from Denmark, three from other Northern countries and three from the South. The new promise of having equal amount of speakers from the North and the South was solved in a paternalistic way. 8 of the speakers came from the South and 10 from the North. Added to the 8 speakers from the South were 8 ”witnesses” from Southern continents on climate change presented not by themselves but by the professional advocacy NGO Greenpeace and the NGO Action Aid. 5 witnesses coming from Asia, 2 from Oceania and one from Africa but none from Latin America. Formally the promise of having half of the speakers from the South thus was solved. Concerning the character of the speakers, an issue characteristically never really discussed, the proportions between speakers from activist networks and popular movements on the one hand and others as celebrities, political parties and professional NGOs was clearly in favour of the latter. Not one speaker was from an activists network as the climate camp movement, 6 can be described as coming from popular movements, Jubilee South, the anti nuclear power movement, indigenous movement, FOEI, the Vestas workers and ITUC. The strongest popular movement in Copenhagen, Via Campesina representing 200 million peasants world wide was not allowed to speak, probably because they upset the Danish organizations by their strong support of the Reclaim power action. Instead a number of celebrities and political parties took centre stage. A top model and an artist from Denmark, a former head on the UN Human Rights Commission from Ireland, a Bollywood artist and a celebrity environmental speaker from India strongly opposed by Indian popular movements and four parliamentary parties from Denmark. Besides these celebrities and political parties there was also one youth lobbyists active inside the Bella Center from India, one representative from Action Aid India and the head of Greenpeace from South Africa elected as speakers. To have speakers from the South did with other words not help getting popular movements on the centre stage, on the contrary were the third world speakers also dominated by celebrities and establishment as the speakers from the North, although some were added as victims presented by forceful NGO actors. Furthermore were the speakers given very different places to speak. In the beginning at the most privileged time for reaching out to mass media were only celebrities and the political party that later fully supported the police attack on the demonstration as well as ActionAid and Greenpeace with their witnesses allowed to speak. The popular movements were all placed at the very end of the speakers list at the Bella Center with the exception of the indigenous speaker who was allowed to come a bit earlier. 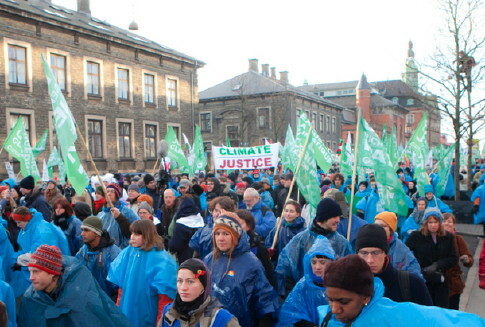 The polarization between the different mass activities in Copenhagen remained after the strong intervention from Climate Justice Now in October but became less severe. A fishermen, peasant and worker, all chairpersons of organizations in the interest of a living sea, small farmers and construction workers, signed an open letter criticizing the idea of civil disobedience at the Bella Center claiming COP15 as more legitimate than CJA. But in general the criticism against CJA lessened from the circles claiming that a big broad demonstration was the best way to put forwards demands in Copenhagen and that CJA was a threat that by choosing a form of action that would cause riot and violence scared people in common off from protesting. 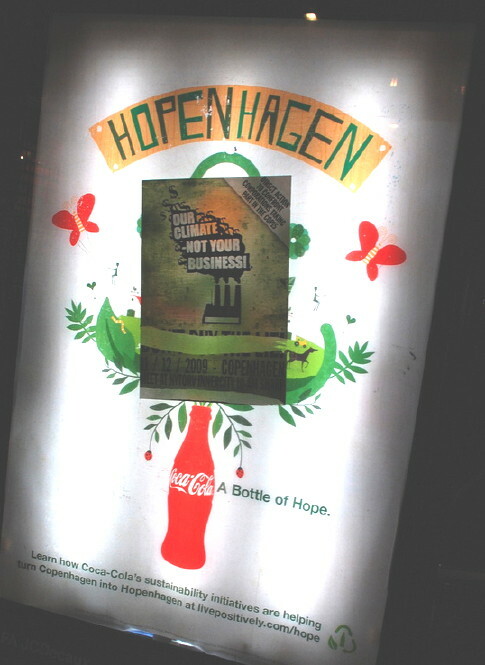 One of the reasons was that it became clear to more and more that it actually was CJA that tried to avoid escalation towards violence in Copenhagen while the risk was bigger on December 12 by groups organizing an anti-capitalist bloc in the demonstration used violent rhetoric in their mobilization material. 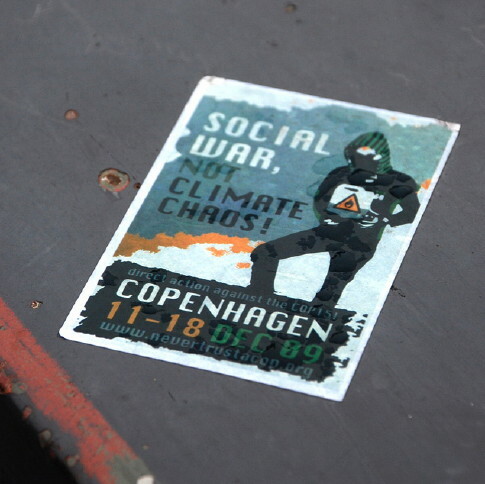 In Copenhagen and on the internet posters signalled symbols for fighting the system and the police with activists in front of a burning city and police cars signed by a network called Never trust a COP, NTAC. Facts that became public in the movement but did not reach the mass media at once. 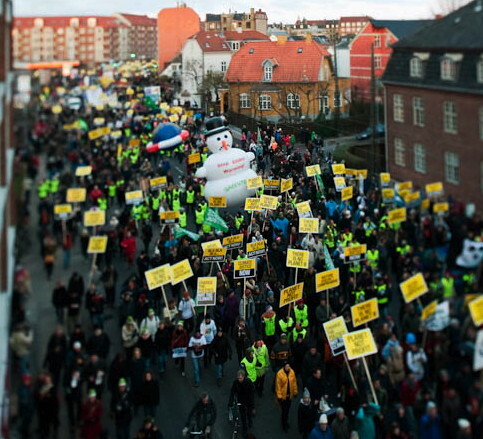 Meanwhile the Danish People´s Party who denies the need for strong measures against climate change but is all for strong measures against demonstrators proposed stronger laws to enable the police to stop protests even more. The right wing government supported the idea and launched a ”hooligan law package”, directed not against violence as it was stated by the media, but primarily against non-violent bystanders when disorder could happen in a manifestation. The law gave possibilities to mass arrest people arbitrary at the wishes of the police for 12 hours instead of 6 hours and the sentences for not following orders from police and remain in solidarity with others non-violently holding each other arms in non-violent protest was raised from a fine to 40 days in prison at maximum. 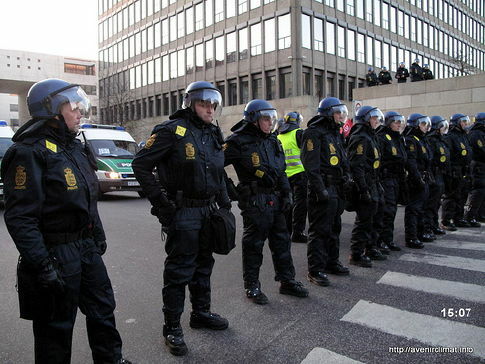 The Trade Union Central in Copenhagen reacted strongly seeing in the new law a threat of a police state against any non-violent protest as pickets, strikes etc. Also a coalition of mainly large NGOs, People´s Climate Action reacted strongly while both 12 December initiative and Klimaforum reacted with less force. The general extreme measures by the government created an image of huge numbers of violent demonstrators coming from abroad to Copenhagen which was negative for the mobilization for the demonstration on December 12 and for all organizing mass activities during COP15. 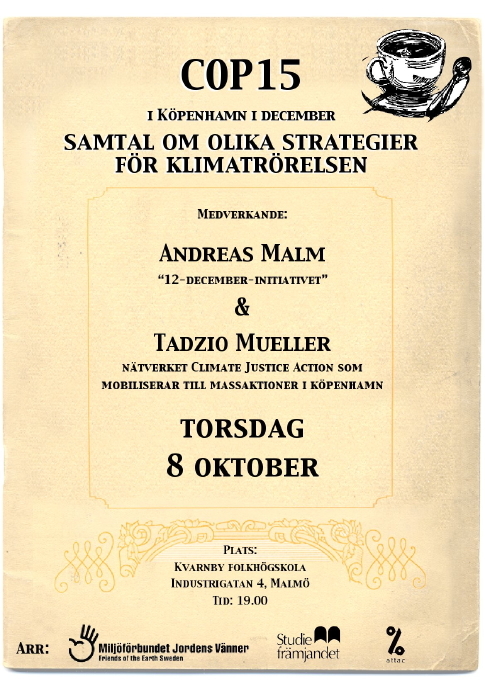 Thus a certain degree of tolerance between 12 December initiative, CJA and Klimaforum started to evolve helped by Jörn Andersen, a key organizer of the mass demonstration and CJA inviting Danish organization for a dialogue. NTAC directed their plans more and more towards own goals during December 12 in the city centre instead of going as a bloc in the mass demonstration to the Bella Center. The information coming via Danish organizations involved in the demonstration and meetings with the police became more and more odd. One report stated that the police claimed that they did not need the new law package, they could already do all the things that the new law package included. This was true. The only difference was that the sentences now became radically much stronger. This was a clear signal from the majority in the parliament that they wished that the police should be free to interpret the existing laws more generously in their own favour while anyone protesting against this now can get a lot harder punishment and as well not knowing in advance how much as the new law package made drastic changes stating either a fine or prison terms for minor offences. That the head of the police, Per Larsen stated the opposite from what the police said in the negotiations with the demonstration organisers and strongly supported the new law package instead as the policemen meeting the demonstration organizers claiming that the new law package did not add any new possibilities for the police. Rather then using these contradictory messages it seemed as if the Danish demonstration organizers were paralyzed by the repressive political climate. Another extraordinary message from the police widely disseminated to the world outside Denmark. The police claimed that if a foreign demonstrator was caught by the police and did not have his pass port with him he could get immediately deported. The risk when tens of thousands of foreign people are participating in a political manifestation that one or some by mistake have forgotten their passports were they stay is obvious. Instead of addressing this very provocative statements by the police the Danish organizers was disseminating the police message as if it was uncontroversial and their single duty to help the police with any demands from the police. Suspicions remained between different actors in Copenhagen and when the news about Never trust a COP mobilization rhetoric reached the mass media in Denmark it caused turmoil. 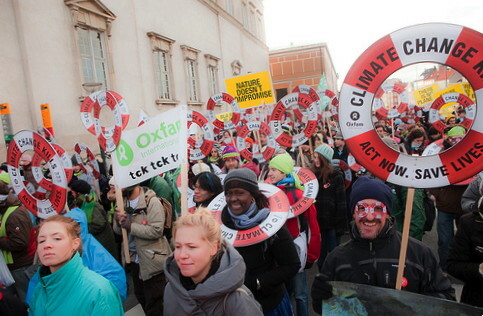 The trade unions were on the brink of leaving all cooperation both with 12 December Initiative and Klimaforum afraid of being linked to violent protesters. The security police predicted that the problem was how violent protesters would use the mass demonstration for starting violence. The pressure was also directed against CJA who had links to NTAC actions on its web site. Finally NTAC was dissolved, as it was claimed that the purpose of the network was fulfilled by mobilizing people to Copenhagen, a model also used during British mobilization for G8 protests in Heiligendamm in Germany 2007. Meanwhile the debate on the violence of protests shifted during the autumn the debate on the violence due to the official politics was more and more marginalized. 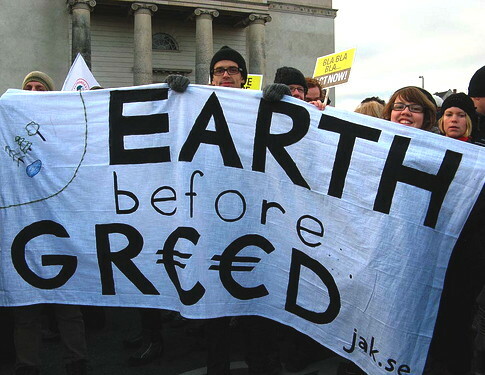 Friends of the Earth Sweden made an attempt at getting Danish organisations to sign a protest against violent results of the present fossil fuels based society causing refugees and wars as well as the violence caused by land grabbing in the name of solving climate change. No single system critical environmental or left wing or any other organization responded. The arguments against shifted from not mixing policy areas to seeing it as impossible to link the strong protests against deportation of Iraqi refugees to the climate issue. Many key radical left wing organisers of the mass mobilisation of protests against the deportation which within 24 hours mobilized 20 000 on the streets saw now possibilities in doing climate actions during the summit as there were too many police mobilized. And thus they saw no possibilities in linking the issues politically either. The criticism against the violence of the present system and the COP15 agenda was by the Danish organizations and their allies marginalized from the December 12 demonstration into the corner by a No Border Day of Action on December 14. Here it was stated that “Climate Change is an issue in terms of migration because the Global South is suffering and the borders are trying to repress them“. At the Klimaforum an ‘International Campaign on Climate Refugees’ Rights’ was launched by indigenous people from across the globe who called for an opening of the borders in the face of increasing climate chaos. 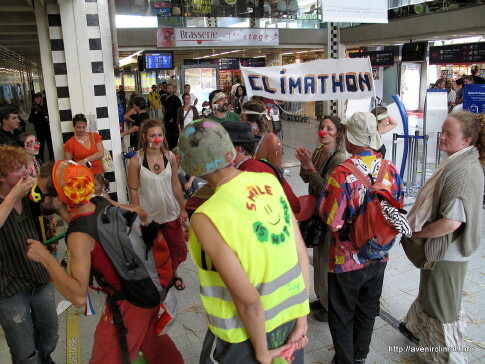 A protest on the climate refugee issue was also made by the parliamentary social liberal Radical party during COP15. Another divisive issue regarded branding. This fairly new concept in participatory democracy was strongly used in Copenhagen, especially by Anglo-American actors. The idea is that it is of importance to show the brand of your organization in as many and positive circumstances as possible and especially in mass media. The winner is the organization that can get most attention for its brand with the masses at a demonstration or victims of indisputable hardships in the visible background. The idea to promote organizational banners in a demonstration for a common goal was for a long time not common in Scandinavia. In recent years it has become more and more common to provide a platform for different organizations to send their own messages if this is not against the often very low common denominator. The left wing and NGOs have made this into a formula proclaiming it to be especially democratic with the open space concept for social forums. Here no common message can be made on behalf of all participants, only each and everyone making their own activity and thus providing a platform for competing brands in the NGO and left wing sector. This maybe have been useful in countries with extremely split left wing unable to cooperate unless extreme formulas are put into place. To the radical ecological movement this was a threat against building a system critical climate movement. They opposed the social forum formula and instead started an open democratic declaration process for the Klimaforum to make a joint forum statement to be adopted by the Klimaforum and all signing organisations as a whole. In the December 12 demonstration process this conflict was marginalised by the way it was organised. From the very start the idea to link the demonstration to any political open discussions on the issue was unquestionably uninteresting to the initiators. Thus the whole preparatory process became strongly depoliticized. This can be seen as partly positive as it opened up for the small ecological Danish organization together with global popular movements to build a system critical platform for the counter summit. But it also made the demonstration preparations lacking in transparency. Throughout the preparation process and also during COP15 and afterwards there were two environmental organizations at the core of the process, Noah, the Danish member of Friends of the Earth International, and Klimabevægelsen, the Danish Climate Movement. Here FOEI influenced the relationships by putting much economic resources into focus upon making its own activity on December 12. As the beginning this was planned as a flood action through Nörrebro district starting at the Agenda 21 local office and ending at Israels plads by forming SOS Climate with bodies coreographed by experts on these kind of action which had been carried out with great success by FoE in other countries. The flood action was mainly seen by FOEI as an issue of logistics as FOE Denmark representatives had agreed to the plans at international preparatory meetings. This model for choreography action and branding motive caused some debates within Noah were other representatives at the same time were more involved in movement building and cooperation between activist groups. It also meant that Noah representatives at times saw upon the main December 12 demonstration as of less importance and that some other organizations were critical towards the way Friends of the Earth stressed their own activity. The original flood action idea run into several problems. One was that it was hard to gt the political motivation for the content to work in Denmark. 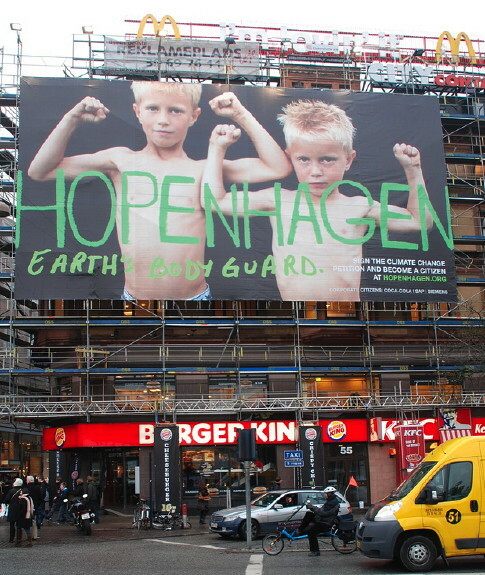 The original SOS climate was early on changed into Climate justice but when asking young people at Roskilde festival about this message most people did not understand the point in it. After the confrontations in the middle of Nörrebro in support of Iraqi refugees other issues took the interest of key people in the district. Finally the flood was turned into a feed in demonstration from close to the Klimaforum to the main demonstration with the aim to destroy a huge offset market set up for the occasion at Christiansborg. Once the flood action had dismantled the offset trading point the main demonstration should gather at the same spot for walking to the Bella Center. Klimabevægelsen did the opposite and put a lot of effort into strengthening the common work with mass activities as 12 December demonstration and Klimaforum. In the end no speaker came from any of the new organization mainly focused on climate while friends of the Earth had a speaker. To put much effort into strengthening ones own organization rather than in solidarity put much effort into organizing something in common seems less successful. After COP15 Noah and Klimabevægelsen have continued a similar division of roles. Both organizes follow up meetings on their own but when Noah mainly focus upon their next campaign for climate law in Denmark Klimabevægelsen makes a very broad meeting with many voices and movemnts present to discuss how to create a broader movement carrying forward the result of the mass manifestations during COP15. The branding culture thus have two faces. One is the most obvious. That of using the common activity to promote your own organizational identity. The other is to see to that the whole mass activity is a good background for your logo or other branding activity. The most obvious branding is that of making an organizational logo or designs linked to a campaign as a promotion of a specific organization effectively visible. Here we have the pandas that for the specific global warming occasion have big red and orange flames coming from their heads so hot that they burn. Here we also have the man and women in red suits, red ties and black shirts with the same professionally designed placards fitting the way they dress with the message from the Action Aid global campaign on climate change. Without being very many participants in this kind of stunts dressing, speaking and acting quite often according to the choreography and manuscript made by professionals the result in attention can be quite effective. This kind of activity does not necessarily is limited to undemocratic organizations as WWF or Greenpeace were members cannot influence the political content and most of designs and action preparations are in the hands of a handful professionals with lay people as those carrying out plans made by others. Also trade unionists used the same method in Copenhagen carrying green working men helmets and equally green clothes under equally green banners with their demands for green jobs. The dress code of different activists groups of more hippie, more young and funky or black bloc design can be seen as similar efforts in sending visible message of group identity although it is not always a specific organization that is promoted. In the case of the black bloc it is also other factors as creating greater problems for police to identify participants that is a reason for the choice of clothes. When it comes to organization logos it is very clear that this is a branding method used by very many. Organizations with a lot of money but less number of activists can compensate this by mass production of their logo on professionally produced visible objects as big balloons, many small buttons or huge banners. 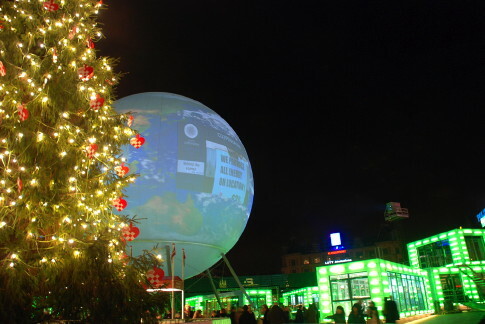 One can also as Greenpeace make huge demonstration objects like many marrionets controlled by a corporate man or a globe with a saving ring and in both cases the Greenpeace logo clearly visible. Organizations with committed activists but little money can make large logos preferably large by hand at a lot lower cost. But especially NGOs and political parties alike but also quite a few popular movements are in different ways today trying to influence the visible impression of a mass demonstration by the use of many organizational logos. These different branding actions needs a supporting background. It is useful with a very large number of people to create the feeling of representing many. Preferably dressed as people in common and in a happy mood, yet with a serious message and not to competing with the message of the own organization. In this respect the December 12 demonstration was almost perfect. As the common denominator was quite or very low it gave the possibility for many different actors to brand themselves with their logo and message. The only formal limitation was that it should not contradict the common platform. At the same time it included a risk. That of one or some messages standing out very much in a way that would contradict the own message. If the whole demonstration was embedded in a culture excepting totally the limitations given by the rules and practices of how mass media, police and other established forces want to impose on any protest this would be problematic for some. If the main message was limited to sending signals to the politicians and giving as high establish status to main messages by selection of speakers and use of technology and design for scenes this would be biased in favour of organizations unwilling to take the common platform in any way serious if this would include confrontation with the established society. 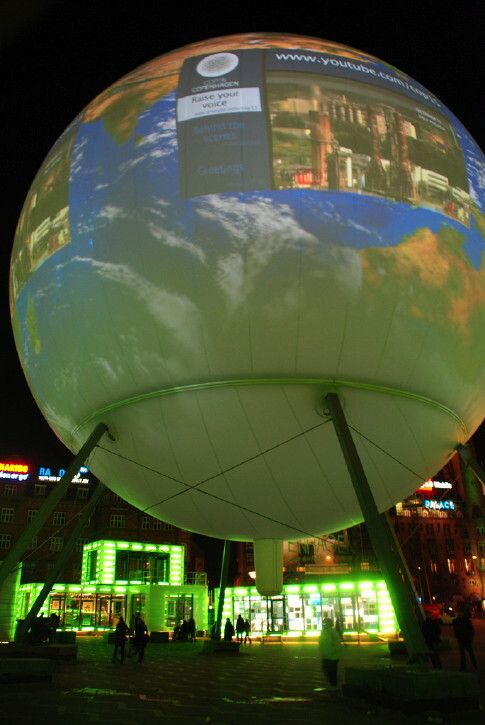 If the whole atmosphere in which the demonstration was supposed to make a call was embedded in a city full with commercial messages on how the market and thus the established system would solve the climate change problem this posed a problem if not accepting the established order was a main message from the demonstration. This becomes even more accentuated if the demonstration is embedded in general commercial advertising making propaganda for more consumption of goods produced and transported in a manner causing climate change. It also becomes accentuated if the most economically resourceful campaign by some of the organization with speakers and strong influence on the main message of the demonstration in parallel runs a world wide campaign. This with the help of social media building a ”movement” organized by advertising agencies and promoting companies as Coca Cola and BMW as is the case with the cluster of campaigns centred around the tcktcktck brand. The other problem would be if groups mainly focused on other issues than those clearly related to the platform sees the opportunity to show how radical and willing to confront the established forces they are in general. By destroying general symbols of capitalism or seeking confrontation with the police without a clear purpose. This turns not only those away who might be interested in misusing the demonstration call for the opposite general ideology, claiming total acceptance of whatever limitations the politicians, police or mass media puts on a demonstration. It would turn also very many away who are truly concerned about the issues raised in the common platform. For some reason more or less the only problem discussed was that of speculations concerning the possibility of violence at the demonstration. Also this issue was awkwardly addressed as if the only cause of violence or disorder can arise from small provocative groups among the demonstrators, not because of lack of discipline and political clarity among the main organizers or by provocations from the police. This in spite of numerous circumstances that the two latter ways often been the main cause of such problems. Instead of balancing the two risks almost all attention was given to the direction that main stream media, politicians as the Danish People´s Party and the right wing government and the police wanted. CJA was more or less alone in distancing themselves from the dominating message of reducing the role of the demonstration to send signals to politicians as sufficient means for changing politics. This caused a very defensive position towards the the limitless apatite for producing an image of a great threat. The security police PET stated that the threat against security was equal to a threat by Al Qaida. The police stated that the great risk was how violent activists would use a peaceful demonstration to hide and start riots from. The Danish People´s Party and the government could raise the level of expected extreme levels of violence further by introducing extraordinary laws not seen in any other country. This with the help of media who accepted that the laws who were directed against non-violent civil disobedience were presented falsely as directed against violence. That politicians were taking such extraordinary measures seemed well fit into the predictions by the police of a threat as big as a terrorist attack by Al Queda and fitted also the logics of the mass media industry. The mass media seemed to long for spreading news about violence against the system. This instead of revealing the self interest among the police and politicians to paint a dark picture in need of more resources for the police and law and order policies while the daily violence organized by the way rich countries solves the climate crisis goes unexposed. Attempts were made to counteract the repressive attacks against protests during COP15 but primarily by making individual statements by organizations and avoiding collective stronger efforts. A demonstration against the new hooligan law package gathered 200 participants and now wide support. The dominant branding culture puts the main effort on each organization by themselves eagerly trying to present their organization in mass media as positive as possible while common concerns more easily gets neglected. In the end if ten out of one million demonstrators throws something in the direction of the police without causing any harm, this becomes the main problem and not if the police arbitrary mass arrest 10 000 of the demonstrators. Collective solidarity against the provocations from mass media, politicians and the police becomes uninteresting, saving ones own name everything. How much this really was a genuine democratic idea receiving positive comments everywhere or something else can be discussed. The executive director of tcktcktck campaign states in an interview that what was especially inspiring was that there was so many signs at the big demonstration in Copenhagen with no branding on them, “People just created signs for the global good.” She talks about how a “massive organism” rather than individual campaigns competing for attention have emerged. The organization that funded the massive amount of non branded yellow signs at the 12 December march was Greenpeace which also was chairing the tcktcktck campaign. It is hard to believe that the executive director of the campaign do not know what the chairng organization of the same campaign is doing. It is true that people were invited to create the message on the signs but if Greenpeace and th tcktcktck campign made the sign for “the global good” can be questioned. It is rather understood by professional campign makers that if one runs a campaign hevaliy supporting the culture of bradning it is also udeful to avopid making it to obvious. A neutral unbranded background fits better for those that can afford branding by many means. Thus creating “a massive organism” embedding the whole climate protests and the streets of Copenhagen with a unifying message which takes no opposition for the oppressed countries of th world against the big countries nor any stand against corporations. A branding operation in need of a clever idea of not branding every sign on the 12 December march. Climate Justice Action also made attempt at the final meeting preparing the joint system change not climate change bloc organized by CJA and CJN. Against the branding interests of organization the CJA people claimed that they saw now need in separating the joint climate justice bloc. Instead they argued that it should be a part of the demonstration were everyone joined supporting a joint message for system change not climate change. The arguments against were of course weak in principal as strong they were in terms of vested interests. The solution obvious from the very start. Those that did not want to go in a specific part of the system change not climate change bloc braded by some specific part of the climate justice movement but only support the general demand could walk in the CJA section. But the principal arguments raised against branding whether it was directed against NGOs of left wing parties or ideological groups was raised. I’m astonished I didn’t discover this details prior to. I believe following I shut this window, I am taking back a great deal of facts along with me.